Nupla has been an innovator for over 70 years in the development of fiberglass technologies and has earned the reputation as the industry standard for fiberglass striking, cutting, digging, and fire tools. Nupla handles are unaffected by sub zero temperatures, do not conduct heat or cold and are impervious to industrial chemicals. Nupla handles are also non-conductive and have a built in dielectric safety feature since Lifetime Nuplaglas is one of the finest insulators available. The 16 lb. Double-face Sledge Hammer has a drop forged, heat treated and tempered carbon steel sledge head with dual machined striking faces and chamfers. The 32 in. hammer handle is solid pultruded fiberglass made with thousands of fiberglass strands and a unique resin making it super strong and resistant to weather, chemicals and insects (unlike most wooden handles). Ergonomic non-slip grip reduces arm strain due to less squeeze and gripping effort required. The Sledge Hammer can be used for house and road construction, farming, landscaping, utilities, and any other heavy duty application requiring concerted use of force. Tbook.com crawls the web to find the best prices and availability on Hammers and related Tools and Hardware products like Nupla 16 lbs. 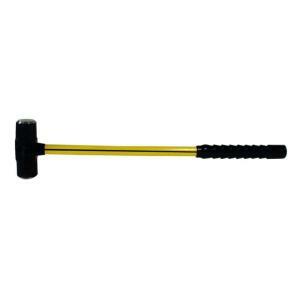 Double-Face Sledge Hammer with 32 inch Fiberglass Handle. For this page, related items include products we find that match the following keywords: "Hammer" at our vendor partner Home Depot. Nupla 16 lbs. Double-Face Sledge Hammer with 32 inch Fiberglass Handle is one of 151 Hammers and related products listed in the Tools and Hardware section of Tbook.com If you have any questions on this product, please give us a call at 734-971-1210 during the hours of 9am - 5pm EST for assistance. Thank you for shopping at Tbook.com, the Internet Department Store!